The day has come! 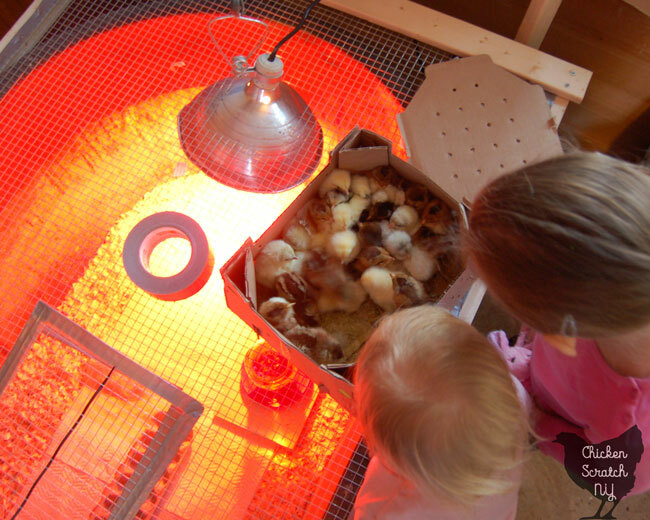 The tiny chicks you ordered online months ago have finally arrived. After you get the little peepers set up and happy it’s time to figure out what the hell you have. If you only ordered one kind of chicken this part is pretty easy. It gets harder based on how many types you ordered and if you got any random assortments. 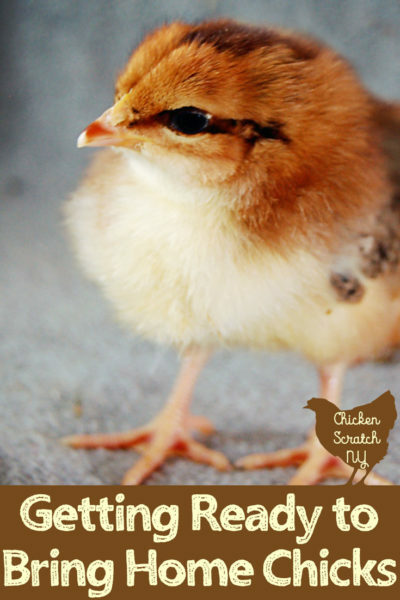 These tips are also helpful for figuring out Mom and Dad when you hatch eggs from a mixed flock. It’s like Maury but less sad and with more poop. Be warned, there’s a lot of poop in these pictures. The second I set the chicks down for pictures 75% of them pooped. 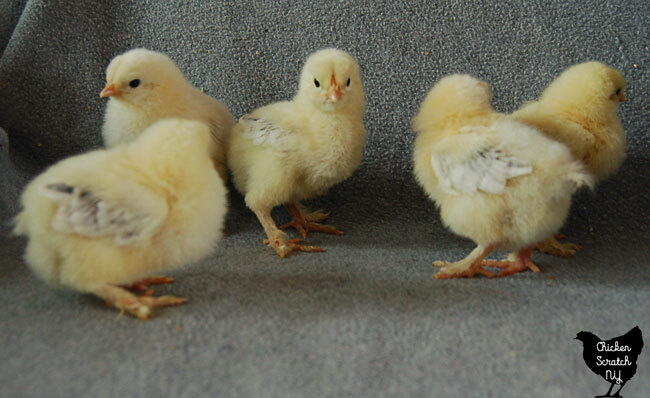 Turns out it’s also pretty tricky to take pictures of chicks. I apologize ahead of time that they’re all slightly unfocused. 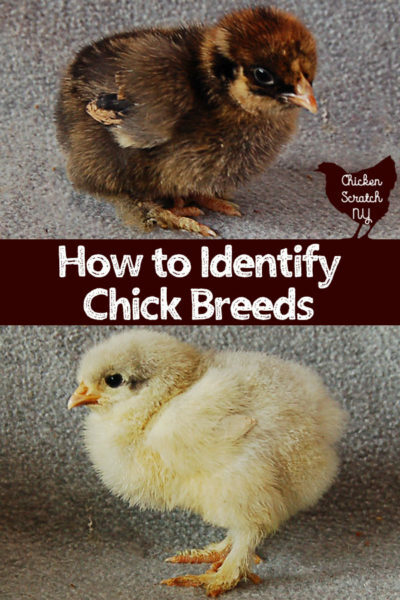 The first thing to do when identifying chicks is to get out the list of what you ordered. This time around I bought Silkies, Cochins, Welsummers, Easter Eggers, Speckled Sussex and Light Brahmas. 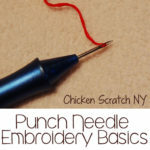 I talked about how to prepare for chicks in earlier posts so check that out for sure if you’re new to chickens. When I ordered the Surprise Box from Cackle Hatchery this process was much more of an adventure! I ended up getting most of them right and it was really fun trying to figure out what everyone was. It’s much harder but these tips with help you narrow down what you’re dealing with. When it comes to day old chicks you’ll have two size options. 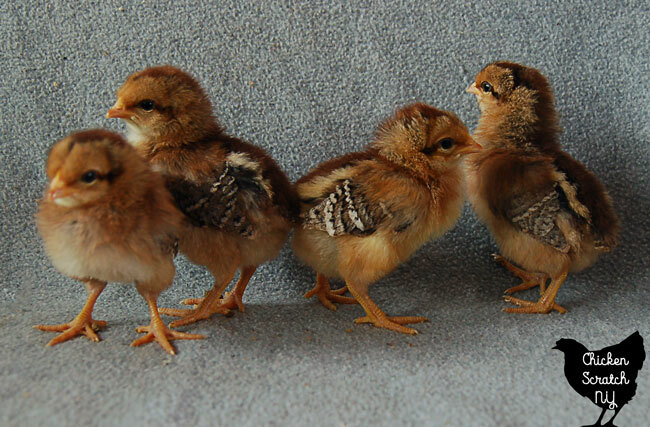 Standard chickens have larger chicks than bantam chicken breeds. 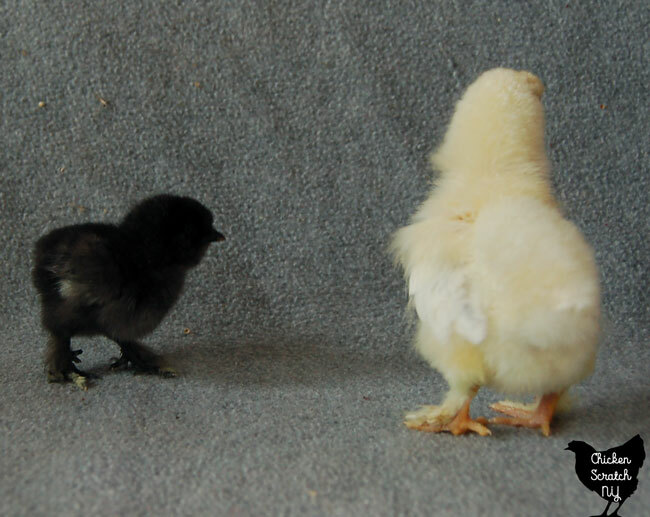 The black chick is a bantam, the uncooperative white chick is a standard size. It’s actually a Brahma, which are the biggest chickens I have and they’re also my favorite chickens. 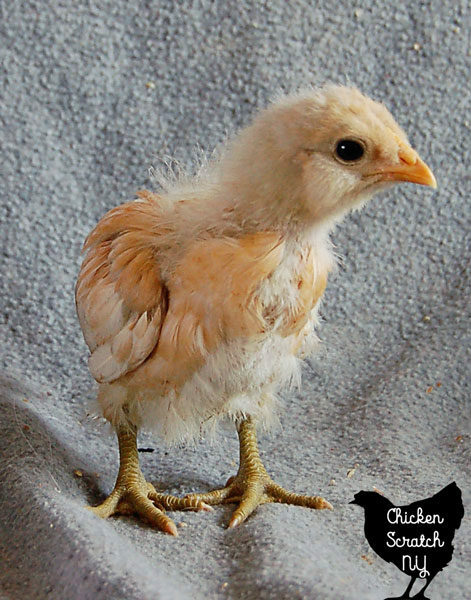 The only bantam breeds I have this time are Silkies. 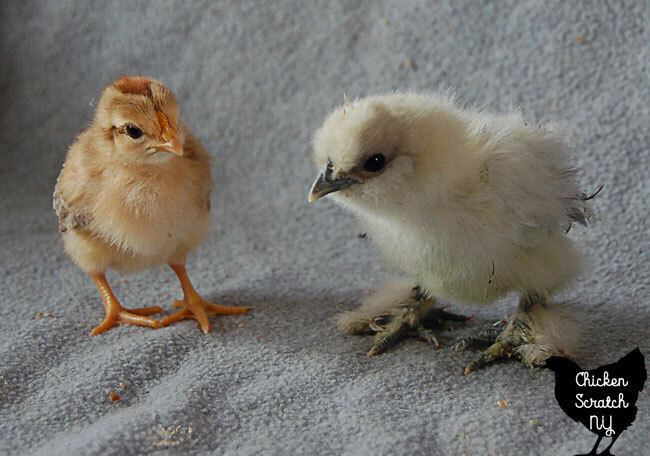 Silkies are pretty easy to pick out for a few reasons but wanted to show the size difference between standard and bantam chicks. 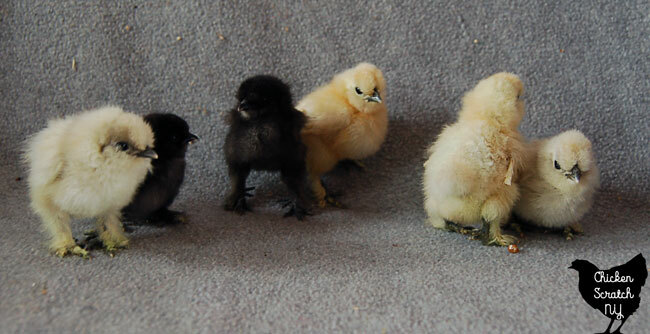 These are my little Silkie chicks. The two black ones are smaller than the others but they all seem equally healthy. I originally thought the others were going to be white but now they’re looking more like Splash Silkies on the lighter end of the spectrum. After three weeks they don’t look that different, just a little bigger. Part of the fun of Silkies is the very fine, almost fur like feathers they have. Don’t worry, I didn’t lose one, they just get harder to photograph and less cooperative as they age. I ordered 5 but ended up with 6. When you buy chickens online you occasionally get sent a few extra. This time Cackle Hatchery sent me 34 chicks instead of 30. When you look at each chicks feet you’re looking for two main things. One, are there feathers? If the breed is ‘feather-footed’ it’s going to have fluff on it’s feet as a chick. The opposite is ‘clean legged’. I had a 50/50 split on this one. 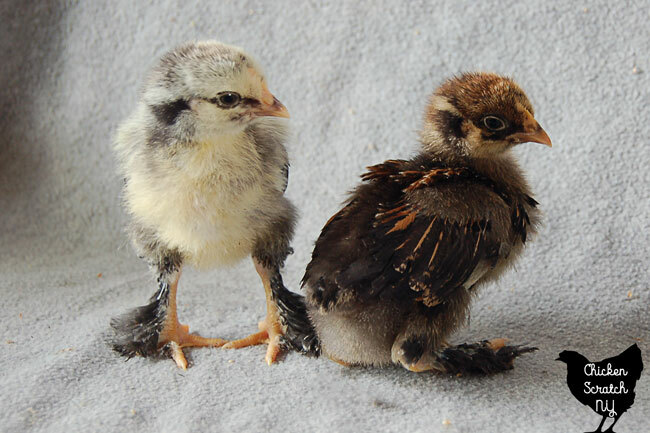 My baby Brahmas, Cochins & Silkies are all feather-footed. The other three are clean legged. These are my Brahma chicks, you can see the light gray on the wing feathers along with the feathered feet. This giant is only three weeks old. Brahmas are big birds and you can already see the size difference. You can also see the grey patterns coming in and the leg fluff turning to feathers. This batch of fluff is all Cochin chicks. The only thing that really sets them apart from the Brahmas at this age is the coloring. I’m really looking forward to seeing what the two darker ones on the left looked like. When you’re looking at the feet you should also check out the leg color. 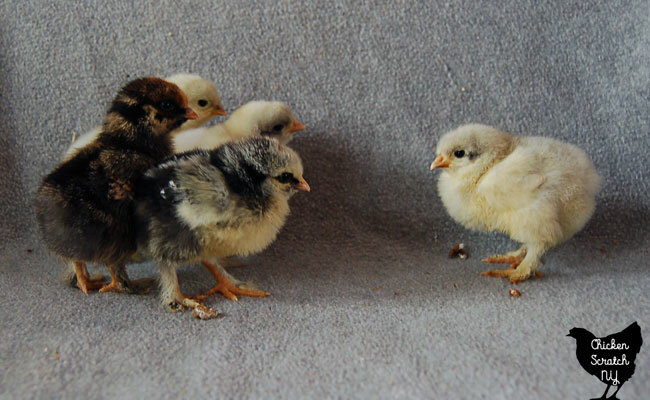 I was able to identify my Appenzeller Spitzhauben chicks based on their slate blue legs and tiny head pouf. One more foot feature to look for is an extra toe. Extra toes aren’t that common in the chicken world. You’ll only see that with Silkies, Sultans, Faverolles, Dorkings and Houdens. If you have a chick with an extra toe that’s a huge clue! Chickens with top knots of feathers will have little pouf balls on their heads. 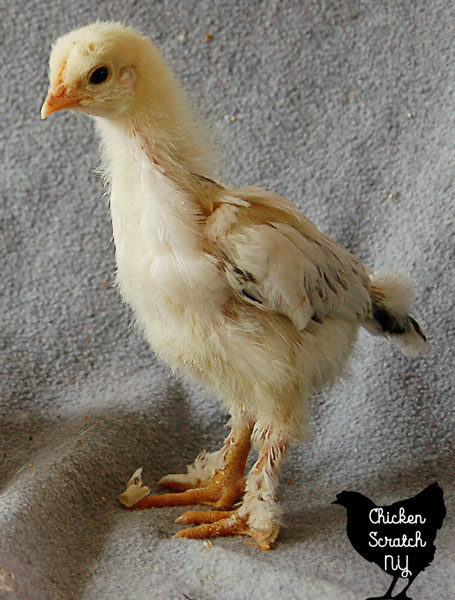 If you have a chick with a tiny pom-pom it’s either a Polish, Spitzhauben, Houden or Silkie. I’m sure there are a couple others but those are the main suspects. Another characteristic to check for is cheek poufs. The most common cheek pouf variety is the Easter Egger. EEs are pretty much mutts. They’re bred from Araucanas. These are the chickens that lay the pretty blue and green eggs! 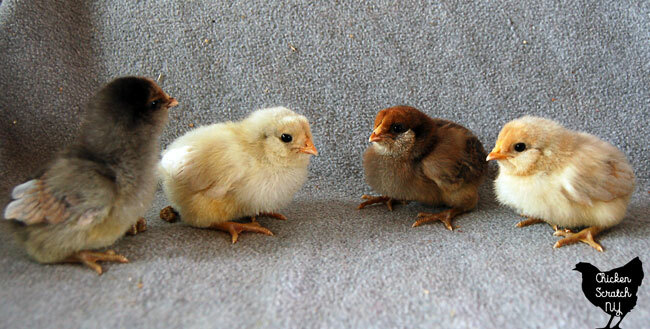 The four above are some of the Easter Egger chicks I received. They’re a variety of colors and hopefully they’ll lay a nice variety of egg colors. 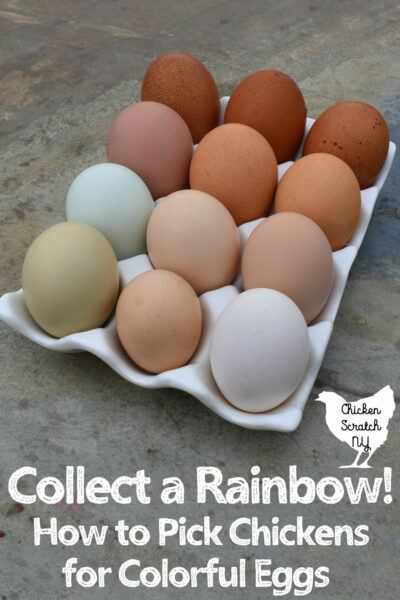 I love having these ladies around to add some color to all the fresh eggs I get. You can tell they’re EE’s because of the extra fluff on the cheeks, it sort of gives them a double chin effect haha. At three weeks old you can still see the poofy cheeks. I’m really happy with this chicks buff coloring. Most of my birds are black and white or dark brown. I do have one older EE hen that looks pretty similar to this and she’s beautiful. Color is probably the least helpful in identifying chicks, unless you only have two options and you need to narrow it down. If you order 25 white leghorns and 25 black austrolorps… Well, you probably don’t need to read this post! When they first came in I couldn’t tell the Speckled Sussex from the Welsummers. They’re both the very common ‘chipmunk’ color pattern. Now, after a few weeks it’s getting more obvious. Looking back and comparing to now, I think the Speckled Sussex had a bit more white on the wings. You can see at three weeks they still have the ‘eyeliner’ going but most of the fluff is gone and the feathers are starting to show their patterns. About half look like this one (Speckled Sussex), the other half have way less white (Welsummer). 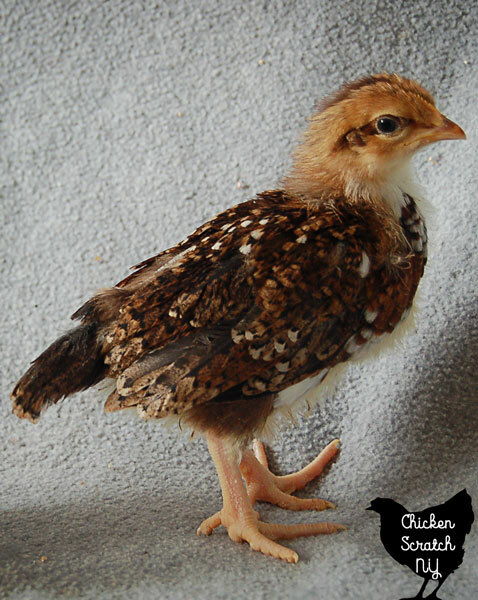 I can’t wait to see how the Speckled Sussex look full feathered and matured. This one is only helpful if you hatch the eggs and know what shells the chicks come from. In my quest for olive eggs I hatched out the darkest brown and bluest eggs hoping for a Welsummer/EE cross. Had I planned ahead I could have penned up my Welsummer rooster with my EE hens but I didn’t. It worked out though I did have a hen laying beautiful olive eggs. If you follow me on Instagram you might have seen the Appenzeller Spitzhauben hen that went broody. She hatched one chick and I stole it from her. It was freezing and wet outside, she also has a terrible track record as a mom! The little tan guy is about a week younger than the others. It’s the same size as the Silkies right now. I’m sure it’s a rooster because that’s how life goes on a farm. I think it’s part Welsummer, part… I don’t know but I’m pretty sure it came from a tan egg. I do have a lot of birds that lay tan eggs so there are a few options and I might get a better idea as time goes on. At this point I have so many types of chickens and a few generations of crosses that it’s anyone’s guess. I have ended up with some really pretty birds over the years. One of my favorites was a Buff Orpington X with something that gave him gorgeous blue feathers in his tail. I hope these tips help you with your own flock, whether you buy them or raise your own barnyard mutts. Don’t forget to PIN this to your Chicken or Homesteading board for later, you never know when you’ll need to play barnyard sleuth! Faverolles also have poofy cheeks. Speckled Sussex chicks have white breasts and Welsummer chicks don’t. I don’t know why you are talking about having bad pictures. I think they are perfect! Especially since they are all of little chicks who run around constantly. Great job! Thank you! I think I took more photos for this post than any other I’ve ever written, probably 200 got the ax before I ended up with these. Chicks certainly aren’t that cooperative! Thank you for the beautiful pictures and information about identifying baby chicks. 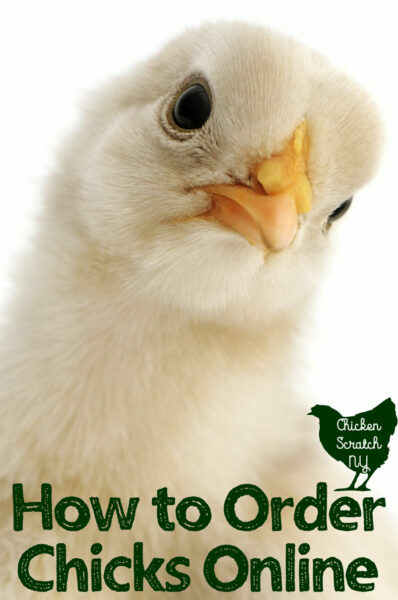 I just ordered 25 chicks from Cackle…. That’s awesome! You’re much more together than I am, I’m still figuring out if I want ducks (answer is probably yes) and then I can order. I love my wyandottes and my Dominique girl, she’s my garden helper every year! 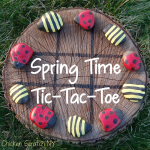 Great job on your post and pics! Very informative and helpful! Thanks so much!